Take a birding adventure to explore the natural areas of Florida, United States, and Tropical destinations-Belize and Jamaica, searching for local, rare and seasonal birds. Through a series of field trips, expert guiding, bird classes and instruction, YOU WILL GAIN knowledge, increase identification skills, add life birds, and enjoy touring with friends. Make checks payable to Patricia Cunningham. Sept. 9 – Ascend to Better Birding-Part I – The Tools of the Trade – bird class – 2:00-5:00 p.m – Bonnet House. Learn how to better use your binoculars, bird checklist and bird field guide book including field marks, glossary, and family organization. Learn about some of the latest birding apps such as e-bird, Audubon and Merlin to make identification easier using your smart phone. Find out about of the wonderful benefits of becoming a bird watcher, great local birding hot spots, and wonderful birding opportunities locally, in Florida and tropical adventures abroad. The workshop includes an informative power point presentation, numerous hand outs and a bird walk through the gardens. Bring binoculars, and a field guide (if possible can be provided upon request). Also if you have bird apps on your phone bring them. CONTACT LINDA at (954) 563-5393 EXT 137. Cost $25. Sept. 23 – Ascend to Better Birding-Part II – Ten steps to better i.d. – bird class – Bonnet House – 2:00-5:00 pm. Learn a 10 step approach to increase your ability to identify birds such as family groups, behavior, silhouette, habitat, field marks, commonality, seasonality, birding by ear, plumage, use of checklist and apps. The class will include an informative power point, numerous handouts, workshop activity and a walk around the garden to look for birds. Bring binoculars, and a field guide (if possible can be provided upon request). Also if you have bird apps on your phone bring them. Great weekend getaway to see hawk migration at its peak. A focus will be on identifying hawks in flight where wing patterns and silhouette are critical in identification. Scan the sky for Peregrine Falcons that screech through the sky dive-bombing prey. At a stop at Curry Hammock State Park we will visit the Hawkwatch research station to search for up to 10 species of raptors such as Broadwing, Sharp-shinned and Cooper's Hawks. Late fall warblers up to 12 species may be found including Chestnut-sided, Swainson's, Bay-breasted and Indigo Buntings and Rose-breasted Grosbeak at Ft. Zachary Taylor. Keys specialties will be targeted and Shorebirds will be spotted at Anne's and a special beach. With a weather event we can hope for a fallout of the last of the fall songbirds at stops at North Key Largo, Windley Key and Ft. Zachary Taylor State Park. LAST YEAR Western Spindalis. COST-$345 (dbl. occupancy) includes 2 days of expert birding by Paddy Cunningham, informational handouts, transportation, breakfast and 1 lunch. BRING-overnight bag, rain gear, sun protection. Learn how observing bird behavior can be essential to identifying a bird. Gain knowledge about flight and feeding behaviors that are unique to a variety of birds. The class will include an informative power point, numerous hand outs and a walk around the garden to look for birds. Bring binoculars, and a field guide (if possible can be provided upon request). Also if you have bird apps on your phone bring them. Sat., Nov. 17 – Plantation Preserve Birding – Audubon – FREE – walk – 8:00-11:30 a.m.
Join local Audubon Society's for a tour of Plantation Preserve wetlands. We will still try for Marsh Wren, wintering warblers and waterfowl, but different this year we try for Barn Owl at dusk. The preserve is on Broward Blvd., two miles east of University Drive. Meet Paddy at the trailhead past the playground. No fee. Sun. Dec 2 – Birding by Habitat – bird class – Bonnet House – 2:00-5:00 pm. I say birds are creatures of habitat. One of the best ways to find the birds you seek is know what habitat where they can be found. Some birds are very specific like Scrub Jays and some more general like Northern Mockingbirds. Learn what birds are likely to be found in the incredible variety of Florida's natural habitats. The class will include an informative power point, numerous hand outs and a walk around the garden to look for birds in various habitats. Bring binoculars, and a field guide (if possible can be provided upon request). Join a team of birders to count the birds of Broward County on this special day. Join amateur scientists all over the country for this important scientific annual bird count. Meet for dinner to find out the total number of bird species found and which group found them. Contact Allison Sherflow at ags1013@bellsouth.net for more information. Sun. Jan. 6 – Ascend to Better Birding-Part II – Ten steps to better identification – bird class – 2:00-5:00 pm. Learn a 10 step approach to increase your ability to identify birds such as family groups, behavior, silhouette, habitat, field marks, commonality, seasonality, birding by ear, plumage, use of checklist and apps. The class will include an informative power point, numerous handouts, workshop activity and a walk around the garden to look for birds. Bring binoculars, and a field guide (if possible can be provided upon request). Also if you have bird apps on your phone bring them. COST-$25 per session for adults. Bring binoculars, and a field guide (if possible can be provided upon request). Pre-registration is required. Cost includes admission to the Bonnet House, so come early to enjoy the gardens. Jan 17 – Joint Meeting SFAS & EBF-Meet & Greet Happy Hour, Light Buffet, LONG KEY NATURE CENTER Keynote Speaker-Richard Crossley. Famous Author of Crossley's Field Guides and the Shorebird Guide. Jan 18 – Corkscrew & Central Prairies, South Dade Hotspots Paddy Cunningham- An introduction to the Natural History of the Everglades. January 26, & 27 – Space Coast Birding Festival – Titusville, Fl. Most advanced birders, bird by ear to identify the birds they seek. The good news is that each makes a unique sound to help identify them. That is the bad news too. Learn birding by ear with techniques such as repetition, use of human words, sound type, family groups, habitat and more. The class will include an informative power, numerous hand outs and a walk around the garden to look for birds. Bring binoculars, and a field guide (if possible can be provided upon request). Also if you have bird apps on your phone bring it. Feb. 15-18 – Florida Whirlwind SPARROW Search Tour – Merrit Island NWR, Guana Tolomato Matanzas NERR, Lake Woodruff NWR and other top hot spots. A whirlwind tour of Central Florida's best natural areas for SPARROWS rare & common and other wintering species. A morning start at Merrit Island NWR along the Shiloh Marsh, Peacock Pocket and a few other selected spots in this top birding destination. At Guana Tolomato Matanzas NERR we will search for the rare Nelson's, Saltmarsh and Seaside Sparrows, plus others. At Lake Woodruff NWR we hope to find the rare LeConte's Sparrow, and common Chipping and Song Sparrows. May include a stop further north depending on what we find on our journey. Discovery when and how to find the bird you seek, by learning to Bird by Season. Through the use of checklists, annual graphs, range maps and apps you will learn to find the target and life birds. The class will include an informative power point, numerous hand outs and a walk around the garden to look for birds. Bring binoculars, and a field guide (if possible can be provided upon request). Also if you have bird apps on your phone bring it. Belize has more than 600 species of birds in a relatively small country. Many of its' varied habitats can be reached in a days' drive. It is possible in a week's birding trip to find 300 species on easy and medium level outings. The tropical forests, savannahs, numerous cayes, wetlands, and coastal plains of Belize offer a myriad of habitat to many birds. Belize's has 37% of it's land and adjacent waters protected under forest reserves, marine reserves, wildlife sanctuaries, national parks and other protected area designation. We will be traveling with the TOP LOCAL GUIDES in Belize who have the local knowledge to find the most species. Trip includes 7 nights (dbl. occupancy), all meals, expert guides, transportation, airport transfer, park entrance fees, lagoon boat tour, day and night birding, and pre-trip Broward Hot Spots tour. Ft. DeSoto is one of the best spots for spring migration and the possibility of 100 plus species for this trip. Varieties can include 15 species of warblers-Hooded, Blackpoll, Cape May,12 shorebirds-Whimbrel, Wilson's Plover, Painted/Indigo Buntings Scarlet/Summer Tanagers, Wood/Swainson/Veery Thrushes and Blue/Rose-breasted Grosbeaks. The drive over includes a stop at Archbold Biological Station for Florida Scrub Jay and Red-headed Woodpecker. On Sunday an early a.m. walk in Ft. De Soto for more, and then south to the Celery Fields for Bobolink, Wilson Snipe, Black-bellied Whistling Duck, shorebirds and possible King Rail. At the Cecil Webb for Eastern Bluebird, Pine Warbler, Brown-headed Nuthatch and Red-cockaded Woodpecker. Trip includes 2 days of expert birding by Paddy Cunningham, 1 night's hotel (dbl.occupancy), 1 lunch and 1 breakfast. Spring migration annual trip to Evergreen Cemetery in Ft. Lauderdale. It should be great for warblers. It is the best time for Connecticut warbler. Also possible Swainson's Warbler and Thrushes. As a tropical island, Jamaica's climate is a bird haven year round. The island also boasts a range of habitat which attracts a variety of bird species, from lush lowland jungles and extensive shorelines to high elevation mountains and midrange grasslands, meandering rivers, dramatic waterfalls, coffee plantations and dry savannahs. There are 28 endemics found nowhere else in the world and last year as we found them all. 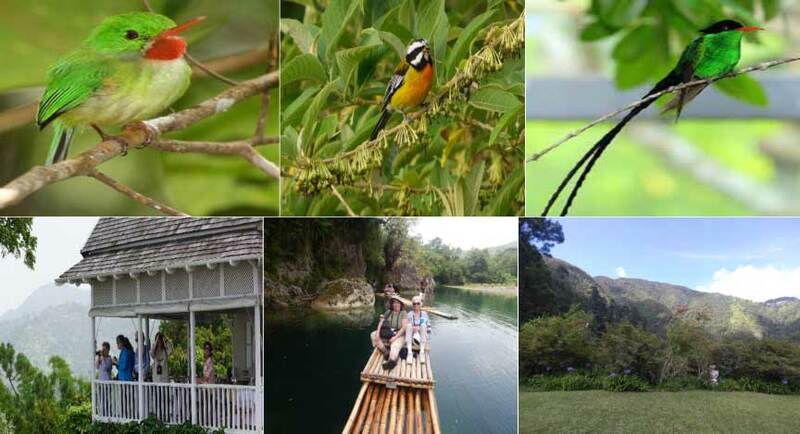 The spectacular views from Strawberry Hill and the veranda of our Blue Mountain hideaway Woodside provide great birding and dining opportunities. Goblin Hill Villas overlooking a turquoise bay is tropical lodging and was a great location for Parrot and Potoo watching. Ecclesdown Road is some of the best birding in Jamaica where we found both Jamaican Lizard and Chestnut-billed Cuckoos. Part of the fun of the trip is the great cultural experiences at the Old Tavern Coffee Plantation and the tranquil Reach Falls. Does NOT include airfare from Miami to Kingston, Jamaica. In order for your me to help you in identifying your birds you need to be specific and give more details and information. Examples-does a bird have a pointed beak (warbler) or thicker seed eating beak (sparrow)? Where did you see it? High in a tree or low to the ground? Size-sparrow sized or larger-cardinal size? Remember watch the bird carefully and record any and all information you can-size, shape, feeding behavior, habitat-marsh, forest, shoreline, place found- shrub, tree, water's edge, etc., any special field marks-wing bar, eye rings, color on tail, etc.. in order to help us identify the bird. Watch it as long as you can before it flies away. Take the information you have observed and recorded in field notes and look in the book for possibilities. If you have an idea what you think it might be, this helps us eliminate possibilities and narrow down what it might be. I hope this is helpful.